"The first half of Red Notice traces Browder’s improbable journey from prep-school washout through college, business school, and a series of consulting and Wall Street jobs before becoming Russia’s largest foreign investor....This book-within-a-book does for investing in Russia and the former Soviet Union what Liar’s Poker did for our understanding of Salomon Brothers, Wall Street, and the mortgage-backed securities business in the 1980s. 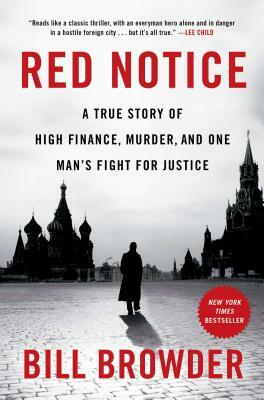 Browder’s business saga meshes well with the story of corruption and murder in Vladimir Putin’s Russia, making Red Notice an early candidate for any list of the year’s best books." "A fascinating and unexpected story." "Browder’s true story is a heart-in-your-throat page turner, and the only close-up look I know of what it’s like to take on Putin. It is also a moving account of a man who found his calling, and ended up winning in the end." "A fascinating, heart-stopping account of how to take on Putin--and win. It's exciting to read about Browder's roller-coaster ride to wealth in Russia, and to learn how his compassion for Sergei Magnitsky, his murdered lawyer, inspired his memorable struggle against the venal apparatchiks of a corrupt state. This is the gripping--and absolutely true--story behind the Magnitsky Law, a signal advance in human rights." "Bill Browder has become one of the most sincerely hated men in the Kremlin over the years--and that is something to be incredibly proud of. . . . This book shows the difference that one person can make when they refuse to back down, as told by a fellow soldier in the battle to hold Putin to account." "Browder’s narrative lays out in vivid detail the often murky mechanisms of Russia’s kleptocratic economy, culminating in an engrossing account of what would surely be the heist of the century were it not so representative of business as usual. It’s also a chilling, sinister portrait of a society in which the rule of law has been destroyed by those sworn to enforce it. The result is an alternately harrowing and inspiring saga of appalling crime and undeserved punishment in the Wild East." "[Browder's] freewheeling, snappy book describes the meteoric rise, and disastrous fall, of a buccaneer capitalist who crossed the wrong people and paid a steep price. . . The high stakes make for a zesty tale." “Bill Browder, the unexpected hero and author of this suspenseful memoir, is no ordinary investment banker. . . . It is fascinating to follow him as he navigates the kleptocratic Russian economy. . . Most of the story is about finance, revolving around things like valuation anomalies and share dilutions, and all of it comes surprisingly alive." "I don’t know anything about investment banking except what Browder has taught me in Red Notice, yet as a reader I was fully engaged by the book’s monumental presentation of the risks, rewards, and personal and financial dangers of doing business in Russia....An unusually affecting book...What Browder says he intends to do now is to 'carry on creating a legacy for Sergei [Magnitsky] and pursuing justice for his family.' A book as resounding as Red Notice may be a step in that direction." “A sizzling account of Mr. Browder’s rise, fall and metamorphosis from bombastic financier to renowned human-rights activist." "Rattling through the high-finance world of New York and London, and then on to the seedier side of life in Moscow, Red Notice sometimes stretches credulity. But just as Browder really is a hedge fund manager turned human rights activist, so this story of courage combined with a dash of obsessiveness is about the real here and now. . . . He reminds us that heroism sometimes lies in unlikely places. Browder deserves our respect."